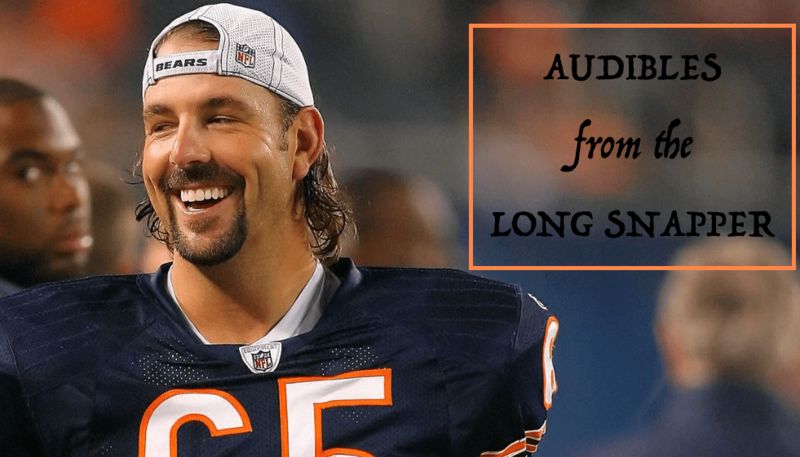 Da Bears Blog | Audibles From the Long Snapper: Biggs, Jahns & Moon on Mitch & More! Potash in the Sun-Times on the hometown implications of the brilliant Fuller and Amos performances Sunday in Baltimore. Pete Dougherty’s lede for his Monday morning column in the Green Bay Press-Gazette: “Pooof. That very well might be it for the Green Bay Packers’ Super Bowl hopes this season.” He’s not wrong. Adam Jahns returns, this time with his film study, pinpointing Trubisky’s most visible improvement from start one to start two: ball security. One of the great literary bars of Chicago, Old Town Ale House, is the backdrop for a new book by Bruce Elliot. The author and his muse are profiled by Rick Kogan in the Tribune. (1) Chandler Jones and Akiem Hicks have 11 sacks through 6 weeks. The Patriots have 14 total. Bill Belichick, personnel man, is overrated. (2) Austin Seferian-Jenkins scored a touchdown in the Jets/Pats game. The fact that we don’t know what touchdowns are any longer is another thing hurting the sport. (4) Denver has arguably the best rush defense in the league. Giants have arguably the worst rush offense, and lost all of their receiving weapons the previous week. So of course Orleans Darkwa went 21-for-117, a 5.6 yards per carry average. This league just doesn’t make sense sometimes. (5) Atlanta got bailed out in Week One by Chicago’s quarterback and pass catchers. They got a gift at the death of the Detroit game, when Golden Tate thought he’d beat them. The Falcons are THIS CLOSE to being a one-win team. I don’t think they’re getting to January.